Eric Dowdle is a prolific folk artist, best known for his whimsical puzzles and prints. Dowdle was raised on a farm in Idaho and then Wyoming, one of twelve children (ten boys and two girls). The basic principles taught and practiced in his home, such as humor, hard work, and devotion to God and country, are depicted in his art. His unique style encompasses the essence of what people hold dear about their hometowns, whether large or small. He also illustrates zoos, balloon festivals, stadiums and fields of favorite sports teams. He couples with organizations, such as the Boy Scouts, and charities, such as Garth Brooks and the Smiles for Life Foundation, to tell their story and help benefit their cause. Dowdle also heads a charity called Gingerbread House Foundation, which raises money for the PTA’s arts endowment program and the Boy Scouts’ Learning for Life program—both Utah youth organizations. Dowdle credits his high school art teacher (Rudy Gunter) for turning him into an artist. Dowdle first became fascinated with folk art when his family lived for a few years in Boston, Massachusetts, after his graduation from high school. He left college after one year, anxious to “go make something happen.” He started painting in his early twenties. He researches globally, and his work is distributed throughout the world through his company, Dowdle Folk Art. His artwork is often described as fun, lively, and happy. 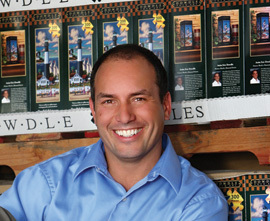 In 2010, Dowdle sold his first millionth puzzle. One year later he sold his second millionth puzzle. The company continues to sell millions of products each year. In 2013, Dowdle Folk Art created an app called Dowdle Puzzle App, which allows you to put together virtual Dowdle puzzles. His vast collection of Utah paintings were compiled and published in 2008 in Utah: Featuring the Art of Eric Dowdle. In 2013 he published Nauvoo: Featuring the Art of Eric Dowdle. 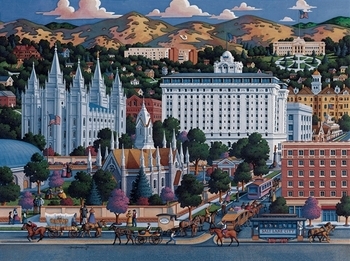 He has received many awards for his work, but the most flattering to him is his award from the 1997 LDS Church art competition for his painting “Sesquicentennial Quilt.” Dowdle is a member of The Church of Jesus Christ of Latter-day Saints. He and his wife Deb, have five children and live in Utah. This page was last edited on 8 May 2014, at 18:00.